The war in Europe should arouse our sympathy for all the nations involved. So far, in this University, there has been a most admirable avoidance of discussion among the students, and a friendly entente between the members of the diverse nationalities which compose a cosmopolitan family. We feel that this avoidance of discussion should extend particularly to all of our educators, who should set an example to the students of academic reserve on any war questions whatever. The University belongs to no faction of the State, the nation or the world. Students, faculty, and administrators heeded this advice from Old Penn in that first year of the war, taking interest only in the experiences and safety of those sons of Pennsylvania who went overseas. As early as 1914, a handful of professors and students left the University to serve in Europe. Professor of Design Paul Philippe Cret, who enlisted as a private in the French Army in 1914, kept in touch with Penn, and his letters were occasionally published in University publications so that his colleagues and students could remain informed of his whereabouts and wellbeing. But it soon proved impossible for the University to remain unconcerned about war questions. By 1915 discussions about the possibility of introducing military training at Penn began. Attitudes toward military training were based on several different areas of concern. Among the most important were the effects on the character of students, the compatibility of drilling with the educational goals of the University, the message that military training in the neutral United States might send countries abroad, and how it might or might not fit in with the principles on which American society rested. In addition, attitudes were occasionally based on experiences in war-torn Europe. 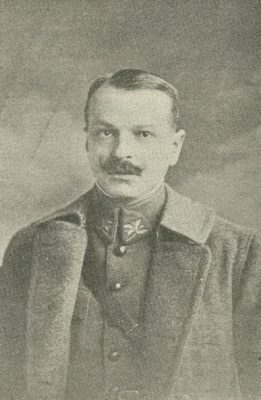 R. Tait McKenzie, head of the Department of Physical Education at the University, journeyed to England in 1915 to help physically train recruits, and returned with the opinion that physically training men before they were called to service would better prepare them for that eventuality. Toward the close of 1915, students in the Towne Scientific School petitioned for drilling and military instruction to be offered as a substitute for physical education. They were not alone among the student population in suggesting the addition of military training. Older members of the Penn community were much more concerned with the potential consequences of military training at the University. In fact, their opinions on the subject were initially very negative, just as were the opinions of many educators of other prominent universities in the country. 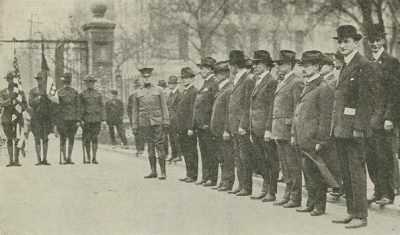 In 1915, a group of Penn alums sent a petition to the Provost at the time, Edgar Fahs Smith, asking that military instruction not be introduced at the University, and stating that such a practice would go against the peaceful aims of William Penn and of the Christian religion. Meanwhile, several administrators and faculty members of other universities were quoted in a pamphlet entitled “Educational Experts on Military Training for American School Boys,” published in Philadelphia around 1916, as stating that military training would have definite harmful effects on college students. Not only would training for war teach boys to be savage and barbaric, but it would also push them to look to war as ananswer to global issues, rather than to other diplomatic measures. Yet, despite such negative comments on peacetime military training from peer institutions, the Penn administration and Board of Trustees saw military training as necessary and beneficial. As early as March of 1916 the Board of Trustees approved the introduction of a course on military instruction at the University, and began work on developing such a course. By October of 1916, the Board had achieved its goal by creating the new Department of Military Science and Tactics,complete with a position for a Professor of Military Science and Tactics. 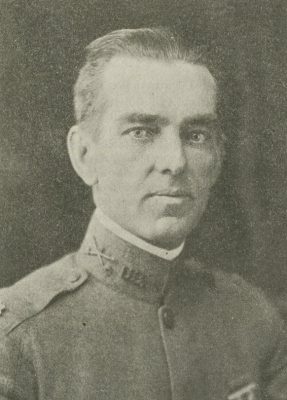 The War Department sent Major William Kelly, Jr., Major of Cavalry, U.S. Army, to fill the new professorship. The University’s administration welcomed Major Kelly as a new full-time faculty member. Thus, in 1916 the movement toward more formal military training began, and more and more people were drawn to the idea. There was by no means, however, unanimity of opinion on this matter. March 1916 began a period of action that brought the University into close association with military training. The faculties of the College and of the Towne Scientific School formally approved the course; Major General Leonard Wood, U.S.A., LL.D., 1903, at a mass meeting of students in favor of military preparedness and voluntary training, delivered a stirring appeal on “The College Man’s Duty to the Nation.” The address was made in Weightman Hall before 2,000 students, about 400 of whom signed a petition to the Board of Trustees for the establishment of a military course. At the Board of Trustees meeting on March 13, 1916, the Board heard a student petition for the introduction of voluntary military training, which included a faculty recommendation. The Trustees then “resolved that the introduction of such a course of training be approved, and authorized a committee, with power, to arrange for the same.” Within two weeks the Board’s special committee on military instruction sprang into action and began to progress toward its goal. 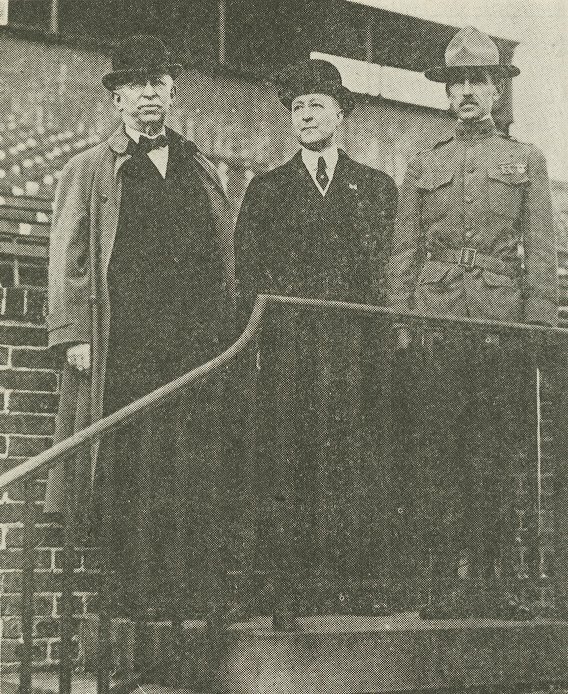 In April of 1916, a regular officer of the United States Army visited the University’s campus in order to determine how the conditions of the University would suit military instruction there. The visit resulted in the idea that an army officer could be sent to Penn by the War Department in the following school year to begin instructing military training. The foundation of all military training is discipline, and the lack of it among us as a nation is deplorable. Were our children taught the full meaning of ‘must’ and raised to obey cheerfully, without question or hesitation, without complaint, the efficiency of all of our institutions, both civil and military, would be vastly increased. William McClellan, Dean of the Wharton School, exemplified the contingent of Americans who aimed to be ready to defend the nation from attack. Although there did not seem to be any indication at the time that the war would spread across the Atlantic in an attack on the United States, McClellan’s belief in the need for “real preparedness” was commonplace. There seemed to be a dwindling number of people who were convinced of the traditional view that mere isolationism was enough to keep the United States safe. Thus, Dean McClellan organized the Intercollegiate Intelligence Bureau. The Bureau’s purpose was to record the specific skills of individual students and alumni who wished to serve in the case of an emergency. This way, the Government could find skilled workers in any field at a moment’s notice. These skilled workers would also be of great use in the reconstruction period following the war. McClellan organized the Intercollegiate Intelligence Bureau in early February of 1917, and by March of 1917 Penn’s division of the Bureau was tackling the ambitious goal of canvassing 20,000 alumni. I certainly cannot understand the pacifist who would not resist attack, and I don’t want to think that there are Americans who would sidestep the responsibility of leadership which is ours by right of natural conditions, as well as of boastful claims in times of safety and peace. Students at Penn engaged in their own debate about pacifism. In March of 1917, a student named George L. Bliss, Wharton class of 1918, wrote a letter to the staff of The Pennsylvanian, the student newspaper at Penn, complaining that the newspaper had been writing articles with a pacifist attitude that did not rightly represent the attitudes of the majority of students. The Pennsylvanian, however, did not apologize. Instead, it argued that it should not attempt to arouse to war thousands of students when the Government apparently did not see fit to do so at the present time. If being pacifist meant refusing to engage in the “yellow journalism” that propelled the United States into the Spanish-American War in 1898, then The Pennsylvanian chose to be pacifist. In addition, the editors of the newspaper warned that war was not to be treated as some contest between collegiate societies, but as a much more serious matter, and thus the newspaper would take caution in writing in its favor. …I am convinced that the constant suggestion of war involved in this nationwide military training would make war more likely to happen… – all of these things constantly suggest war and tend to make men more ready to choose war rather than some other means of settling disputes. To the careful student of history the statement that the compulsory training provided for in this bill is merely to prevent invasion is meaningless or futile…. The habit of anticipating war, of preparing for it, of considering it a normal and even necessary way of settling difficulties between nations has been and remains the greatest obstacle to the guarantee of peace. The newspapers of the country are not doing the nation any real service in creating the impression that we are on the verge of war… The President’s plan to organize the neutral opinion of the world and to bring its combined influence to bear on the German Government cannot help but have a far-reaching effect. There is strong reason to believe that Germany will pause before placing herself under the ban of universal condemnation. Even after the German plot to bring Mexico into the war should the United States enter, Professor Rowe saw danger in acquiescing to war fury. He warned against allowing “blind passion” to interfere with the American people’s better judgment on questions of foreign policy. Professor Rowe did not see military preparation and the security of the United States as being mutually inclusive. Rather, he seemed to think that the opposite was true; the United States would be better off remaining neutral in matters of the Continent, as it had done for most of its history, than letting a surge of war enthusiasm drag it into the conflict. Excessive military training was just one example of such a surge in war enthusiasm. Dr. Cheyney opposed military training in the colleges for reasons more extensive than just the course it would provoke for the United States as a nation. He saw many disadvantages for the students and the educational system at the University of Pennsylvania. Cheyney truly believed that the greatest lesson that professors could give their students at the University was that of how to think independently and creatively. Military training demanded unquestioning obedience and uniform thinking, both of which were absolutely antagonistic to Cheyney’s goals for higher education. Cheyney also argued that students would respond to the opportunity and freedom to take voluntary action if need be, but would be quick to resent compulsion, just as any American in tune with the founding ideals of the United States could be expected to do. This attribute was what made his students the “finer type of young Americans.” He was all the more convinced of his opposition to military training by the fact that a good portion of the students at the University seemed to agree with him. In his address to the Senate, Cheyney stated that many of the Penn students with whom he had conversed were strongly opposed to military training for various reasons.